Since 1962, Kenda has made bicycle tires and tubes that are designed to help you be your best. Now KENDA Tube Protectors are introducing peace of mind by offering a product that will protect your bicycle tube from puncture flats. It's so good. It's guaranteed. When inserted between the bike tire and tube, KENDA Tube Protectors provide a protective layer between road hazards and the inner tube. The Tire and the KENDA Tube Protector work together to prevent sharp objects from puncturing the inner tube. KENDA's advanced Micro-Infusion Technology creates a hardened outer surface that provides added protection from road debris,thorns, rim cuts, glass, nails, and other sharp objects while the softer inner surfaces cushions the inner tube and actually protects it from the harder outer shell. - Lightweight - Weighs less than liquid fills and thorn-resistant tubes. - Easy Installation - No gooey mess. - Absolutely, Positively - Will not cause tire or tube damage-or loosen spokes. 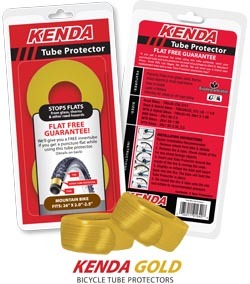 KENDA Tube Protectors are available from participating KENDA Distributors. Please contact your distributor for pricing.